Integrated with other QTAR applications, such as Time & Attendance Management. Providing integrated systems is our specialty, so our clients receive the best value for their investment, and are able to use the same equipment, badges and data for multiple purposes. Our systems can also be customised to meet unusual needs. If required, the QTAR system can provide sophisticated levels of access restriction, including combinations involving people, time and day - such as restricting access for a group of people to their normal working hours, excluding bank holidays. Attempted violations of the system (door forced, door left open, window opened, etc) may raise an alarm and are logged. Optionally, all accesses to secure areas can be recorded. Egress buttons may be used to exit a restricted area (rather than using a reader), but in this case there can be no record of who has left the area. A listing of all people currently recorded as being present on site can be produced automatically (e.g. triggered by a fire alarm) at a suitable location. 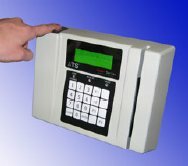 QTAR systems can be used with a wide variety of reader types (including biometric readers) to operate almost any type of access control equipment. In addition to the traditional means of controlling vehicular access with a hand-held swipe card or proximity card, automatic operation of a barrier or gate can be provided for vehicles with activation at a distance of 6 to 8 feet between the vehicle and the reader (which may be as far in front of the barrier or gate as required for optimum operation).